The 71st regular session of the United Nations General Assembly met this past September, which also coincided with the High Level Meeting on Large Movements of Refugees and Migrants. 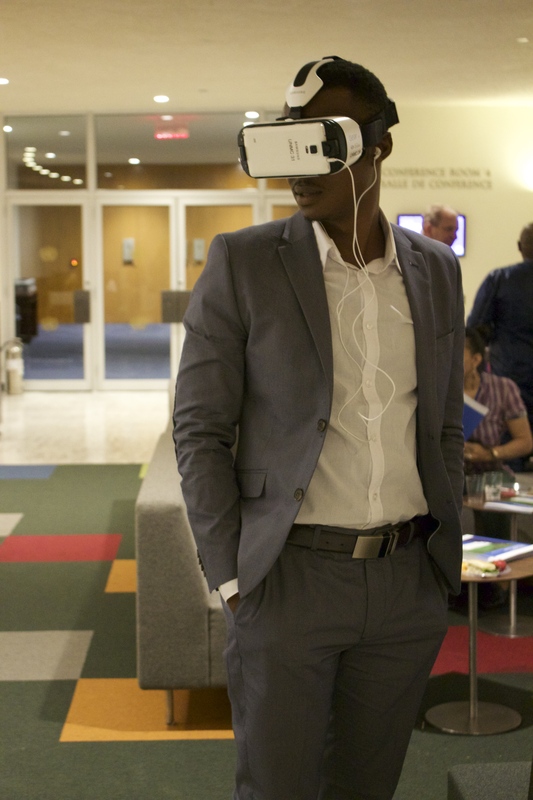 In an effort to raise the voices are those most in danger of being left behind, the UN SDG Action Campaign brought two immersive technology experiences to the UN Secretariat Building, highlighting some of the most complex global challenges the UN faces. The particular focus on refugees, displaced people, and migrants allowed diplomats direct access and a deeper understanding of their everyday realities. Above: Haider al Abadi, Prime Minister of Iraq speaking to Waleed, a young boy displaced from Mosul by violence now living in the Harsham IDP Camp. Below: Ewan MacGregor, Goodwill Ambassador for UNICEF poses with Mirna, young girl he met on his last visit to the Camp in Erbil. 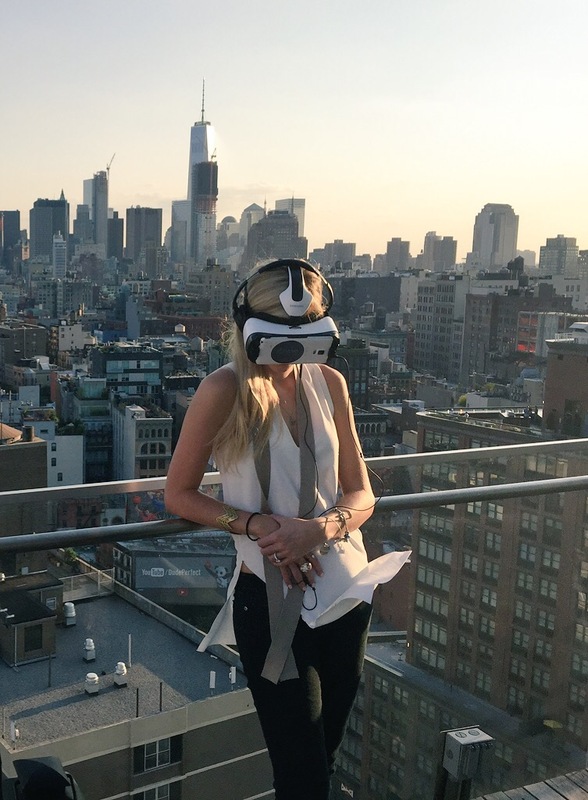 The United Nations Virtual Reality film series and Portals immersive experiences enables people to access locations and situations they would otherwise never experience, providing context for some of the most complex issues the UN is striving to mitigate. By doing so, the Campaign hopes it will help transform understanding of critical global issues that must be addressed in order to achieve the Sustainable Development Goals into a medium that is instantly empathetic and universally relatable. Throughout the course of the week, Delegates were able to watch several films on the newly launched UNVR app (available at www.UNVR.org) about the everyday realities of refugees. Filmed in the Zaatari Camp in Jordan, Clouds Over Sidra recounts the new normal for a young girl from Syria, and Born Into Exile by UNFPA highlights the importance of providing safe births for mothers, revealing the amazing statistic that zero mothers have been lost at the camp. Beyond the Lake recounts the harrowing experience of a woman escaping violence in Burundi who is able to start a new life in the DRC through the support of UN Women safe spaces. UNOCHA also previewed Home, a new film documenting the UN Secretary-General’s humanitarian tour, highlighting the plight of refugees living in Lebanon, Syria and the DRC. Delegates further had the opportunity to have full-body conversations with individuals living these realities, in real time, through the UN Portal, curated by the Campaign, Shared_Studios, and Bridges of Understanding. It is part of an international project with countless locations around the world by Shared_Studios. The UN Portal connected to the Harsham IDP Camp in Erbil, curated by UNICEF Iraq, allowing delegates to speak to young Iraqis displaced by fighting in Mosul. It also connected to a refugee resettlement home outside of Berlin, where delegates could speak to people from Chad, South Sudan, Afghanistan, and Syria in varying stages of asylum seeking, and to young people at the University of Kabul in Afghanistan with Turquoise Mountain Institute. In the afternoons, the UN Portal connected to Mexico City with an NGO called Proyecto Habesha that is supporting Syrian refugees in coordinates higher education degrees in Mexico. This exhibition was made possible through the political support of the Government of the Netherlands, the Government of Germany, the Government of Iraq, and the UN Department of Information. The Campaign also shared the space with UNICEF’s Time Machine, an installation that translating childhood memories from data into unique sound – giving visitors and delegates attending the UNGA an opportunity to understand the data on children currently available and areas that fall short. Be one of the first to download new VR Film: “Waves of Grace”! It is our pleasure to announce the release of our next Virtual Reality film: Waves of Grace, now available for Virtual Reality headsets and for use with/without google cardboard on Android and iOS mobile phone platforms through the Vrse.works App. Waves of Grace captures a young woman’s tale of love, loss, and rebirth amid the Ebola epidemic. In the film we accompany Decontee Davis, a native of West Point, Liberia, as she guides us through the streets of her township, into schools, hospitals, abandoned buildings and burial grounds. She finds solace by using her immunity to help patients, care for those orphaned, fight stigma, and in the faith of forgiveness. The film draws attention to the lingering effects of the Ebola virus and supports the Secretary-General’s push for continued attention and support to the Ebola response. It was originally prescreened at the United Nations Secretary-General’s International Ebola Recovery Conference, hosted to ensure affected countries receive the support they need to end the epidemic and continue countries on the path to recovery. Waves of Grace is the second VR film of the UN Virtual Reality and Vulnerable Groups Series, result of a collaboration between the United Nations Millennium Campaign and Vrse.Works – with the additional support of Vice Media for this film – and co-created by Gabo Arora and Chris Milk. The series attempts to draw attention to the world’s most pressing challenges and to bring the voices of vulnerable groups directly to decision makers. In using Virtual Reality technology, the aim is to create deeper understanding and empathy and to inspire action towards these causes. The first film, Clouds Over Sidra has met with international acclaim, winning Best Interactive Award at the Sheffield Doc/Fest. With iOS system or Android Phone using Google Cardboard: Download the Works App. With iOS system or Android Phone without Google Cardboard: Download the Works App. Thomson Reuters Foundation – Kieran Guilbert “A virtual reality film aims to draw attention to prejudice towards Ebola survivors by guiding viewers through the life of a woman in Liberia who uses her immunity to help others affected by the disease, the creators said on Tuesday. 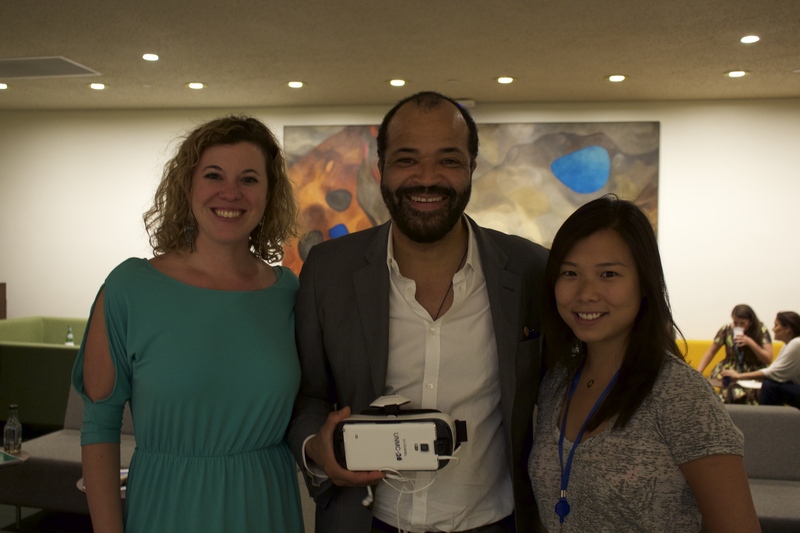 The United Nations Millennium Campaign screened a sneak preview of their latest Virtual Reality film, Waves of Grace on Friday 10 July at the United Nations. Its premier was planned in conjunction with the United Nations Secretary-General’s International Ebola Recovery Conference, hosted to ensure affected countries receive the support they need to end the epidemic and continue countries on the path to recovery. Waves of Grace follows a young woman’s struggle for life amid the Ebola epidemic. The movie is the result of collaboration between the UN Millennium Campaign, Vrse.works and Vice Media, and was created to call attention to the obstacles faced by Ebola survivors. The movie transports viewers to West Point, Liberia and follows the experience of Decontee Davis, an Ebola survivor who uses her immunity to help others affected by the disease. The VR experience captures the Liberian tragedy from illness to recovery, mourning to perseverance. It is part of a larger initiative of the United Nations Millennium Campaign to fight donor fatigue on the world’s most pressing challenges. “The Ebola crisis has captivated the world in its devastating effects over the last year and a half. However, the individual stories behind the numbers are often not told. Decontee’s story captures the strife and spirit of the communities across West Africa in the wake of the Ebola epidemic. It is hoped that this second VR experience will promote greater understanding of the socio-economic impact of the disease and empathy for those who continue to overcome it.” said Gabo Arora, co-creator of the film and Senior Advisor for the UN Millennium Campaign.